Get your firearms locked and loaded. You�re going to the far corners of the earth to hunt some of the wildest animals rarely seen by the human eye. Choose from diverse weapons like sniper rifles, crossbows, and high-powered shotguns to capture your greatest trophy ever. 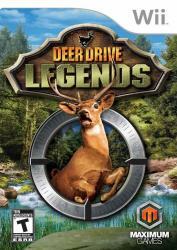 Featuring more than 30 elusive animals including woolly rhinos, white-tailed deer, wolves and Irish elk, Deer Drive Legends for Wii puts you up close and personal with some of the deadliest creatures in the world. Go against the feared T-Rex, saber-toothed cats, and more in vicious boss battles. But watch out�these animals are eager to turn you into dinner!